Dobi Catering and Take Out in Leechburg, PA welcomes buffet service inquiries for occasions and social gatherings. Dobi Catering and Take Out only uses fresh chicken and immediately goes into a marinating process. After marinate, the chicken is either dusted with our signature spices and pressure fried to a golden brown or seasoned with our signature spices and smoke roasted with our signature smoke. Our traditional process produces a crispy outer layer while preserving the moisture in the meat. Our smoke roasted process produces a crisp smoky outer with tender succulent meat. Once you taste either of our chicken styles, you'll long for it again and again, it's that good! Our chicken packages include the breast, leg and thigh. Wings are sold separately by the dozen and half dozen, prepared in the same manner as our chicken. Our customers tell us that we offer the “best tasting chicken this side of the Allegheny.” Stop by today to taste the yummiest chicken ever! Our buffet menu is designed to allow the party host the maximum flexibility when customizing their meal selection without the burden of purchasing items that are traditionally “included” in the price. Nothing is truly free, and these “included” items are charged back to the host in the form of higher food and service prices. We strive to eliminate the unnecessary expenditures for your event by providing the options of selecting foods and services that are desired. The end result, the host has the party of their choice at an affordable cost. Dobi prepares an assortment of appetizers that entertain your guests before the serving of the main course. Our appetizers can be used in situations requiring a light meal. Our appetizer list is extensive. Dobi offers an endless possibility of choices in developing your menu selection. Our main course selection includes a choice of at least three entrees and three side dishes. Party host’s have found that the variety appeals to all of their guests. All of our foods are made fresh for your event. Dobi offers a variety of possible choices for your breakfast needs from hot menu items to a continental type meal. Please contact us to discuss your needs. The Dobi Buffet Menu is designed to allow the party host the maximum flexibility when customizing their meal selection with out the burden of purchasing items that are traditionally “included” in the price. Nothing is truly free, and these “included” items are charged back to the host in the form of higher food and service prices. Dobi strives to eliminate the unnecessary expenditures for your event by providing the options of selecting foods and services that are desired. The end result, the host has the party of their choice at an affordable cost. Dobi Catering is a well established caterer serving the Western Pennsylvania area since 1962. Dobi has built a reputation of serving the finest quality foods within the host's budgetary requirements. Our menus contain no hidden costs. Our Banquet Coordinators will work with you to plan your event and provide you a written quotation of the service and associated costs. Our mission is to exceed our customers expectations and we are committed to achieving this goal. Dobi operates a retail store servicing individual and social event pick up orders. Our store is open seven days a week and we welcome any host considering to cater an event to stop by, announced or unannounced, to sample our homemade food products. 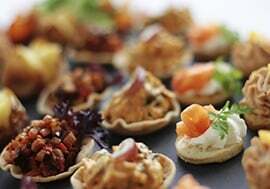 Tasting the food is the true test when selecting a caterer. Dobi prides itself as being among the few caterers that offer this type of customer challenge. We are confident that we will achieve our mission once you visit us and taste our foods. The staff at Dobi will be pleased to be given the opportunity to assist you in making your event a memorable one. Buffet pricing requires a 50 person minimum order. A nominal delivery fee is accessed on orders below minimal delivery threshold and outside of our normal delivery areas. A $25 fee is accessed for the setup of the serving table for non-serving events. A nonrefundable deposit of $250 is required for date reservation. Total payment and menu selection due 10 days prior to event. Prices subject to 6% sales tax. Total payment guarantees food selection and pricing. Events less than $250 must be paid in full for reservation. All foods are prepared and packed in disposable containers. Any equipment or non-disposable containers sent out on a delivery will have a deposit fee attached. These items must be returned in the same condition and clean within 48 hours of the event upon which the deposit will be returned. Decorations are not included in any menu. Dobi serving and clean-up personnel are available for an additional charge. Condiments, when applicable, may include mayonnaise, ketchup, mustard, salt, pepper (cream and sugar if coffee is ordered). Cookie Service is available if you would like our personnel to put your cookies on trays and serve for an additional $50 per service. Cookie trays are extra with this service. Cake Service is available if you would like our personnel to cut your cake and serve for an additional $50 per service. Cake plates are extra with this service. Dobi serving personnel repackages remaining event food in disposable containers for host's convenience.